Podcast » Podcast #63: Is Your Habitat Adequate Enough? 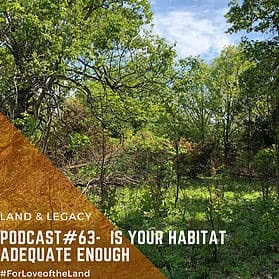 Podcast #63: Is Your Habitat Adequate Enough? During this week's podcast, we cover a variety of topics regarding habitat management, food plots, and Praire Hollow property updates. We have been putting in lots of time post-turkey season to land improvement on the home base property. We are excited to bring you some of those updates. Just like that, we are full force into food plot season. We have the RTP Genesis Drill on site and planting ahead of the rain. Check out this link to learn more about the Genesis Drill we are using to successfully plant our plots this spring.